Award winning medical illustrations for presentations, articles, medical journals, grant writing, textbooks, and more. Custom developed to your order. Expert, anatomically accurate illustrations for medical device and pharmaceutical manufacturers. For examples of the quality and accuracy possible, please visit our Medical Images Gallery for samples of completed work. Randal McKenzie is an experienced anatomist. He works closely with scientists, surgeons, and researchers, spending a significant amount of time each year in research facilities and ORs. Randal McKenzie's award winning illustrations have been used in the New York Times and seen on Oprah and Nightline, as well as in thousands of authoritative publications. In addition to custom pictorializations, McKenzie Illustrations offers a wide variety of “off the shelf” images that can be licensed for use in presentations, textbooks, articles, and more. Images are available for cardiothoracic, orthopedic, neurological, tissue regeneration, stem cell procedures, general scientific illustration, and more. Contact us today to learn more. Communicating ideas through accurate medical illustrations is as important today as it was in the time of Henry Gray. From illustrating surgical procedures to demonstrating proper technique in the use of a new medical device, illustrations bring an immediate clarity of concept that cannot be matched by either words or video. Randal McKenzie brings decades of experience, award winning talent, and the eye of a trained anatomist to your project. He is able to communicate your ideas visually, bringing a compelling style and precision that few illustrators can match. Samples are available in our Medical Images Gallery. 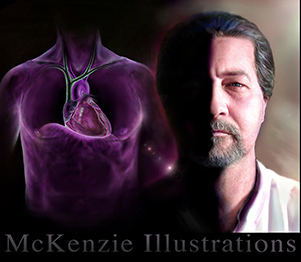 Why Choose McKenzie Illustrations for Your Project? Ease of communication and collaboration with a medically knowledgeable artist whose dedication to accuracy and excellence will surpass your expectations. Quick turnaround times. Affordable pricing. Want to learn more? Contact Randal McKenzie today.